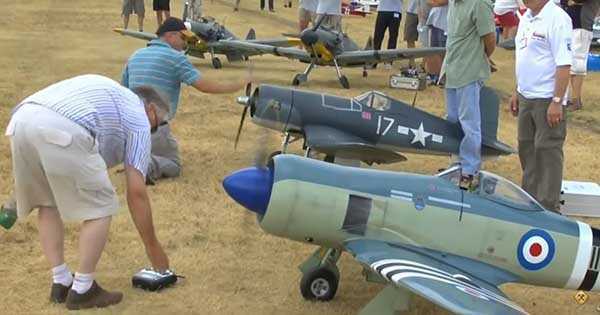 The Ultimate RC AIR SHOW With Gigantic Airplane Models! - Muscle Cars Zone! The Ultimate RC AIR SHOW With Gigantic Airplane Models! What you are about to see in the video below is definitely one of biggest RC air show we have ever seen. You can see all kinds of pilots that are piloting their huge and realistic airplane models. Their airplanes are definitely conquering the skies. You can see airplanes of all sizes and types. You can see planes from very small to incredibly huge and massive 4-engine bombers. You can also see some huge turbine jets that are storming through the skies. You can also see very realistic WW2 bombers that definitely have some great detail on them. Despite bombers and fighter planes you can also see realistic commercial aircraft models. You can also see the famous BAE HAWK RC Jet Red Arrows which are RAF`s favorite. These Red Arrows are definitely one of our favorites and are proving to be one of the sensations on this RC air show as well. However, what we found very much intriguing is the RC model of an Avro Vulcan XH558. This plane is dubbed as the Spirit of Britain and is the last remaining example of the Avro Vulcan 134 jet powered delta. We are simply in love this jet and the guys who made this RC model definitely did this legendary model justice. You can see it cutting through the air like the real thing only on a smaller scale. Before watching this video, we suggest you to turn up your speakers and enjoy the thunderous sound these airplanes are producing. Marvelous stuff. Finally, check out the 10 best RC aircrafts!